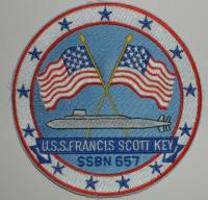 The USS Francis Scott Key was awarded one Navy Unit Commendation (NUC) and one Meritorious Unit Commendation (MUC) during its 30 years of service. Each of these awards has its own story and with the help of the shipmates that were present, we will tell those stories. 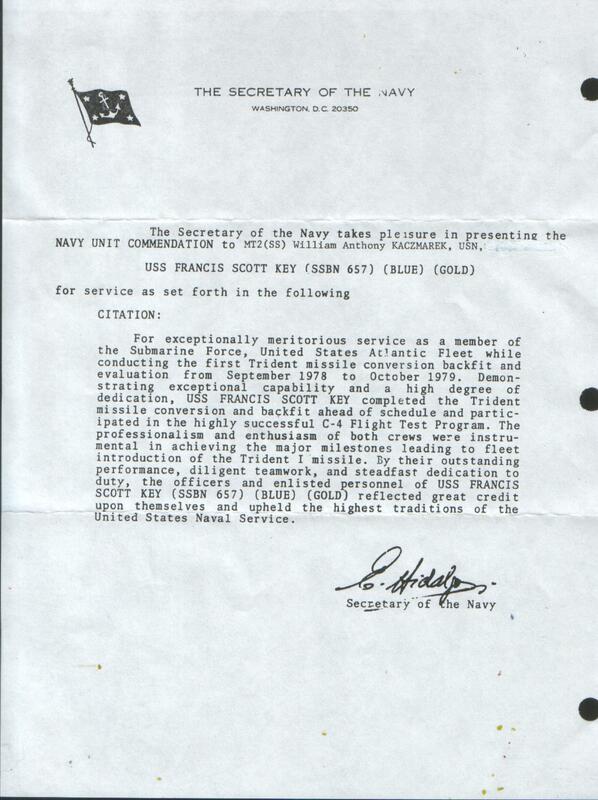 We received a copy of the May 11, 1970 MUC from Tom Courtien MT3. Tom also provided a written history behind it. 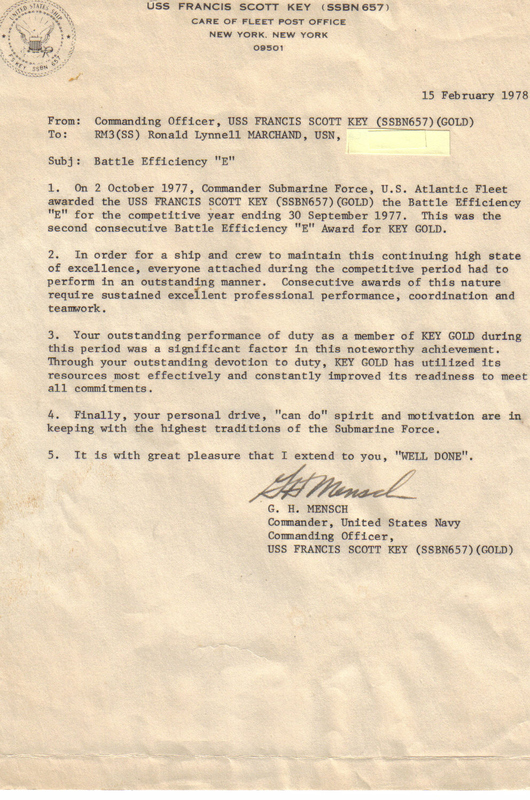 The NUC covering the first Trident I launch and first Trident patrol was sent in by Bill Kaczmarek MT 2 along with Bill's comments regarding the launch. Click on the links below to read the history of some of the Key's finest hours. 1970 MUC - Ripple missile launch with explosive failure of last missile Click for details. 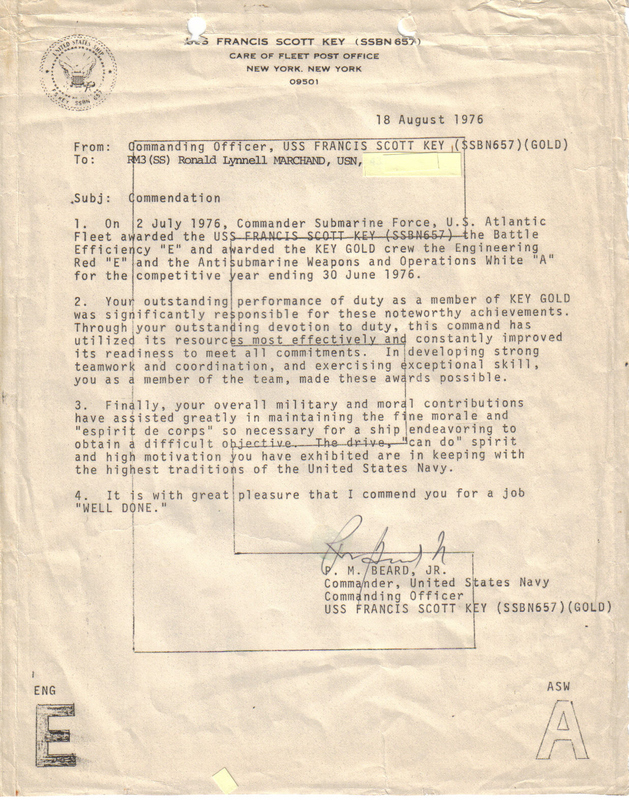 1978 - 79 NUC Click here for pictures and details.- Awarded to the USS Francis Scoot Key Blue and Gold crews for the first submarine Trident I launch, first Trident I backfit and first Trident I deterrent patrol covering the period from September 1978 to October 1979. 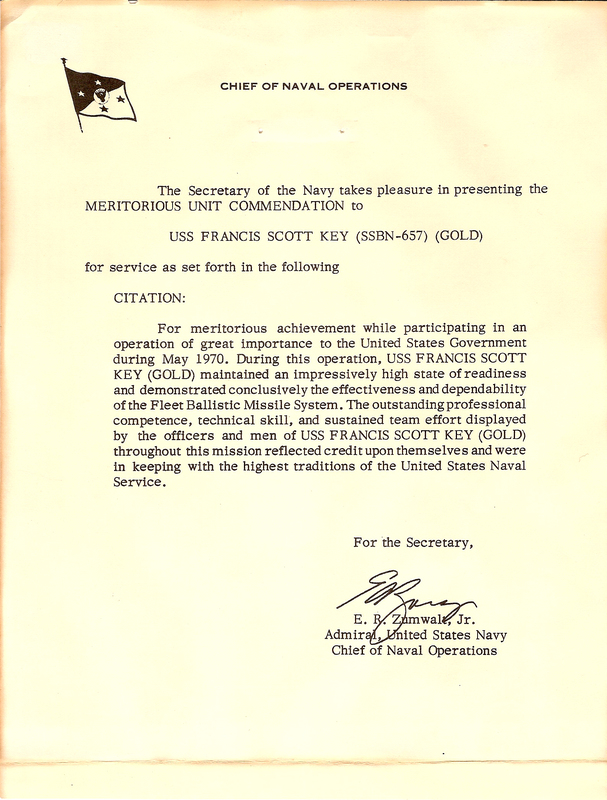 The Key was awarded several Battle "E"s during its long history. We are not sure how many but here are two submitted by RM Ron Marchand, one from August 1976 and one from February1978. We do know that during the years 1976, 1977 and 1978 the Key was awarded the Navy Unit Commendation, two ASW and Operations White "A"s, two Engineering Red "E"s and three consecutive Battle Efficiency "E"s.